At the web browser, “Hello World” can be seen when it is directed to http://localhost:8080.
index.exposed = True // to tell CherryPy that index() method will be exposed and only exposed methods can be called to answer a request. This allows user to select which methods will be accessible via the web. cherrypy.quickstart(HelloWorld()) // mounts an instance of the HelloWorld class and starts the embedded webserver. It will run until explicitly interrupted. When the web application is executed, the CherryPy server will listen on localhost at port 8080. The default configuration of CherryPy server can be overridden by using another configuration file or dictionary. When it receives the request for the URL http://localhost:8080, it searches for the best method to handle the request, starting from the first instance (HelloWorld). The root of the site is automatically mapped to the index() method. The HelloWorld class defines an index() method and exposes it (@cherrypy.expose). Therefore CherryPy will call HelloWorld().index() and the result of the call is returned to the browser as the contents of the index page for the website. In order for CherryPy to call a page handler, it has to identify which and where to call for a given Uniform Resource Identifier (URI). A Dispatcher object is used to understand the arrangement of handlers and to find the appropriate page handler function. The arrangement of CherryPy handler by default is a tree which enables the config to be attached to a node in the tree and cascade down to all children of that node. The mapping of URI to handlers is not always 1:1 and thus it offers more flexibilities. It has to check what are the entries in the table. Then it sends that query to the device system, row by row. – requires delay! Because raspberry Pi isn’t that fast to pick up the replies. 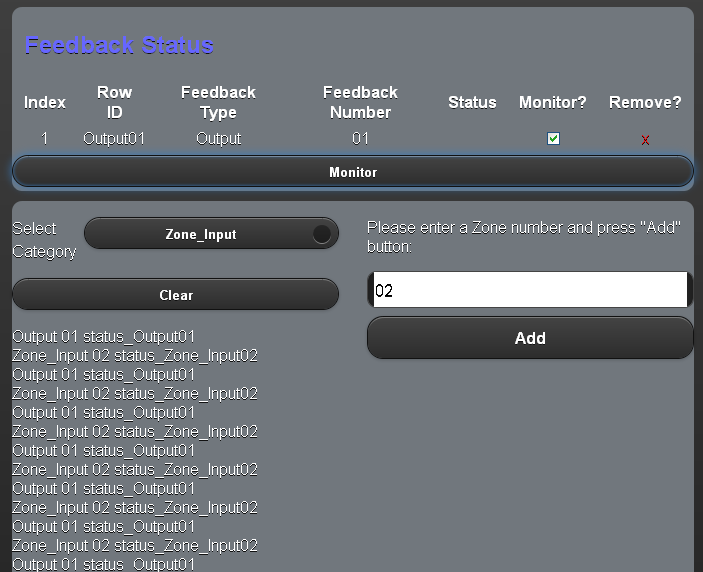 Then it has to continuosly monitor the status. – requires a loop! where checked.length will refer to the number of checked checkbox and 3000 (in ms) is the delay i set. I found out that 1000 (1 second) is too fast for Raspberry Pi. So to be safe, i used 3 seconds instead. Well currently i still have not figure out how to use checked.length instead of index to multiply 4 seconds. I chose 4 seconds is because i would like to give it more time allowance to execute the commands. The only problem with index*4000 is that if the list is long and the index is large, the initial waiting time is long too. Also, I have a “monitor” button to make things easier. The monitoring process will only starts when the button is clicked. Then to prevent multiple clicks which would mess things up, I disabled the button when the monitoring process is running. I would like to thank my junior for giving me this suggestion! I was using colour indicator (which was very weird and ugly) to indicate the button status. hahaha. See my printscreen below. Checking if there is item in the list. The button is disabled initially. When the first item is added, the monitor button is enabled. When a row is removed, the looping interval is cleared and the monitor button is enabled again. There is a div for myself to monitor what is going on in the loop (as can be seen in the picture above), but it is tedious to scroll down and down or refresh. so i created a clear button. The clear button clears off the testing div. 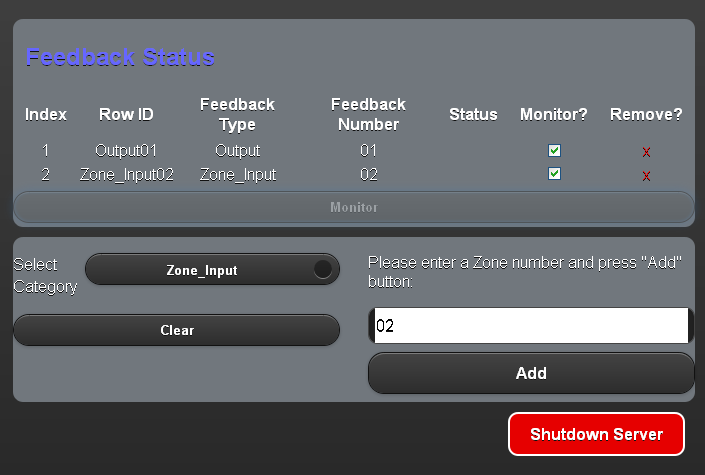 I’ve manage to settle the output status, zone_input status, and even counter value! Well, the process seems a bit complicated to me but i shall read more about it and post about what i’ve learnt later. Reset button makes life easier but can be disastrous if you accidentally click on it. opps. // id and value is your own choice. Value is what that appears on the button. //’#reset’ is the id that you set. Note: (Special thanks to Michael for explanation on this little jQuery magic.) is because it is getting a list from the selector. So now it is getting the zeroth item from the selector. Thanks to Michael, i have a better understanding on CherryPy. It is rather amazing to use jQuery to create little boxes and buttons on a webpage. Hmm, i still have not figure out how to print the screen of Raspberry Pi… Anyway it looks pretty cool! 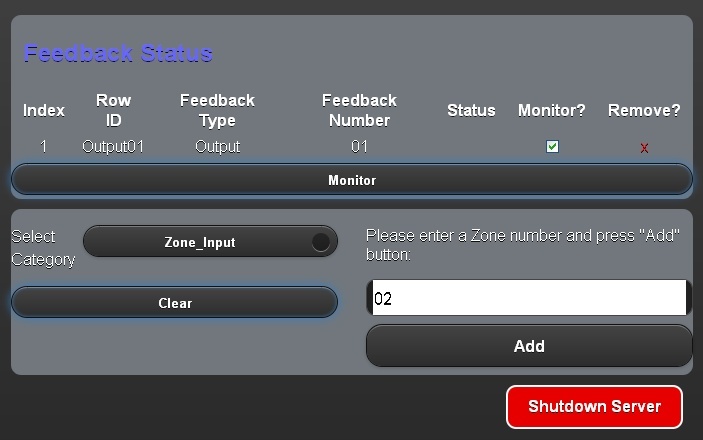 I have solved the problem of getting the input from the virtual keypad and use it to log into Comfort system. it is all about setting the right id and using the right id at the right place. Then, i encounter another problem of different def functions causing those control buttons under different functions unable to send command (because of the log in?) Okay, sound confusing. Found an awesome keypad for my application here. I have added the keypad to the sample web app successfully. Now that i need to use the keypad to Log in to the device by sending the log in information to the Raspberry Pi webserver and the server will send to the device through the serial port.